We love our trees at Chimney Sheep! Did I also mention we hate waste? A while ago we started collecting up the floor sweepings which comprised a lot of wool, mixed it with some other wool scraps and shredded cardboard, and combined with pulp waste from a nearby jam factory started making pretty good compost. We’ve got a small area of grass and flagstones out the back of the unit and this quickly started filling up with trees in pots. In the winter it was bitterly cold with a savage wind blowing straight off the sea. 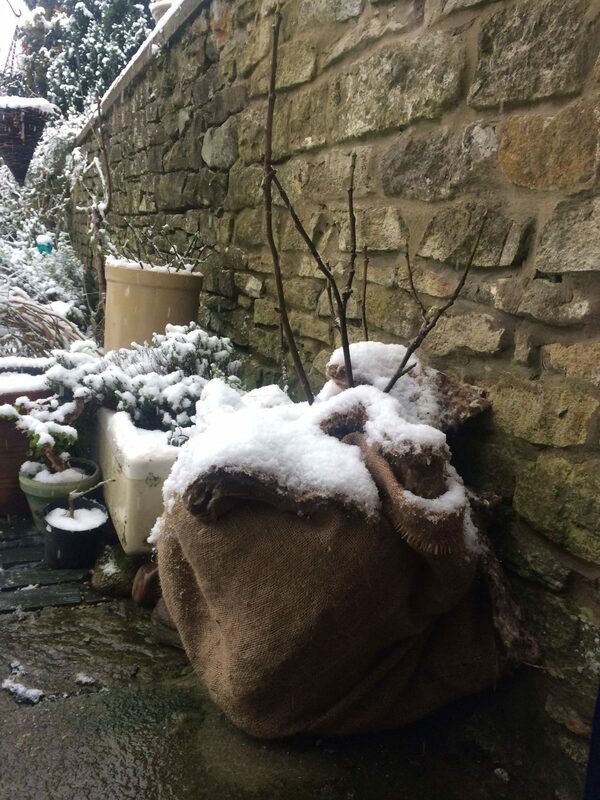 We tucked the plants in with offcuts of felted wool to stop them from getting too cold. In the summer it got really dry, so we left the wool where it was to keep the moisture in the pots. However it was still a lot of work watering them all, and when the pots got over-dry the water just ran straight through. So we got some of our pieces of felt and put it under the pots, on container lids, to act as capillary matting. 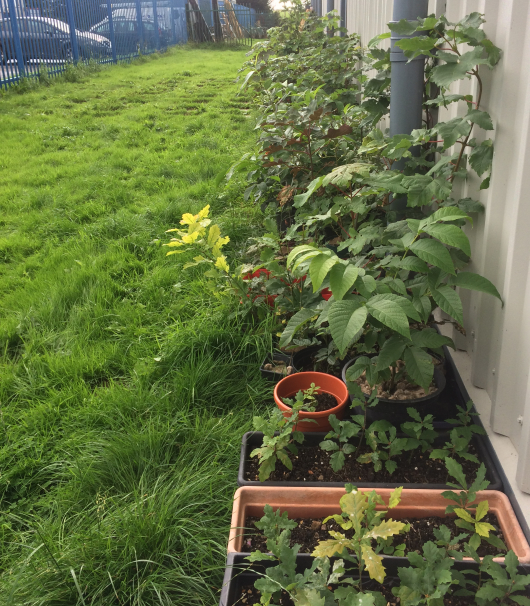 It all worked a treat and now we have a mini forest at the back of our industrial unit. We found that the off-cuts of felted Herdwick wool made excellent mulch for the garden. It naturally kills weeds and grass by depriving them of light, so they are unable to compete with the plants you are protecting. It provides biodegradable mulch that slowly decomposes, releasing valuable nitrogen into the soil. The grey Herdwick felt, when chopped into small bits, bears a pleasing resemblance to slate chippings or “shillies” as they are referred to locally. So Herdwick wool felt shillies became part of our range, and very popular they are proving to be too. You can make a decoction of garlic (have a look at our Hole-less Hostas recipe) and pour this over the shillies to make an effective slug and snail deterrent. The natural weed control fabric is 5mm thick needle-felted jute. It can be cut to whatever size is required, and in response to requests from customers we have added a range of jute weed mats to our range. We started with small 8” round jute weed mats that fitted neatly onto pots. 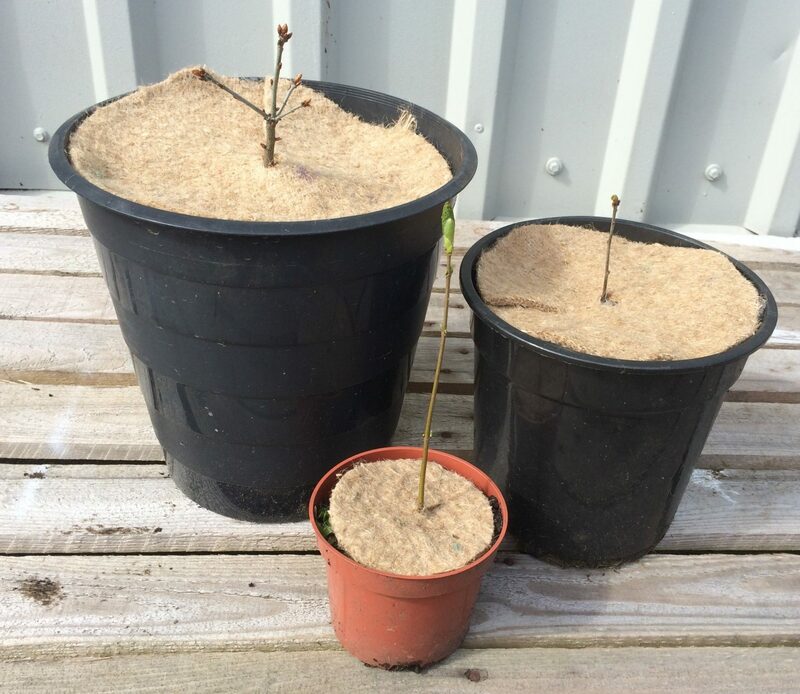 We then got a lot of requests for 35cm biodegradable tree spats, which became our standard eco-friendly weed mats. These come in packs of 5 or 10 but we are happy to do greater quantities. We were then asked for 40cm weed suppressant mats for commercial bilberry growers, so now we can offer larger tree spat mulch mats. Garden matting is perfect for chemical free horticulture. We also chop these off-cuts into smaller pieces which make lovely Cotswold stone coloured pieces of mulch. If you are a vegan gardener keen to be wool-free then this is the mulch for you. Young trees must be watered well for the first few years of their lives, and it is important to keep the weeds under control. Conventionally this is done using chemicals or strimming. If you’ve ever seen a young tree scarred around the base this is probably a strimming wound. 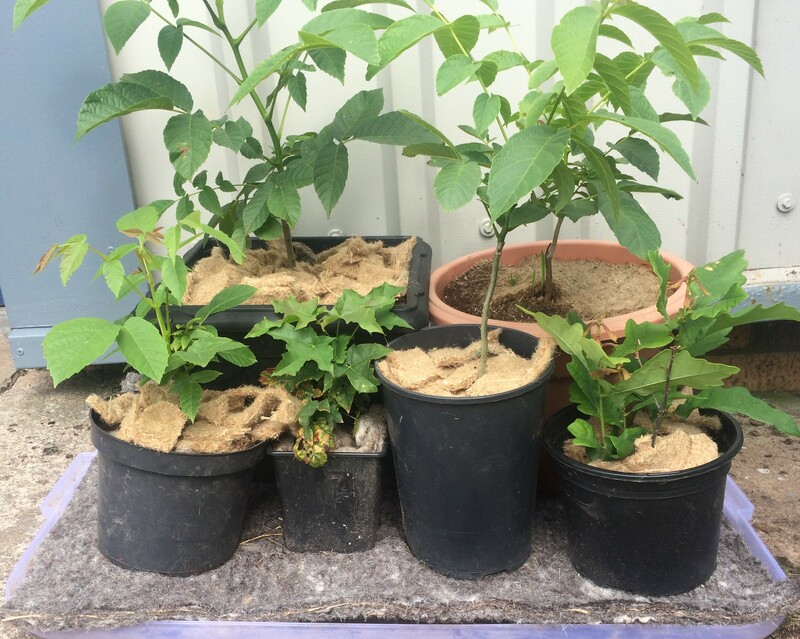 Felted jute tree spats provide non-chemical weed control, reduce labour and materials costs, and will protect a tree for well over a year before it naturally biodegrades. We are investigating stocking latex impregnated jute tree spats – these last even longer but are eventually biodegrade naturally. Do get in contact if you are interested. 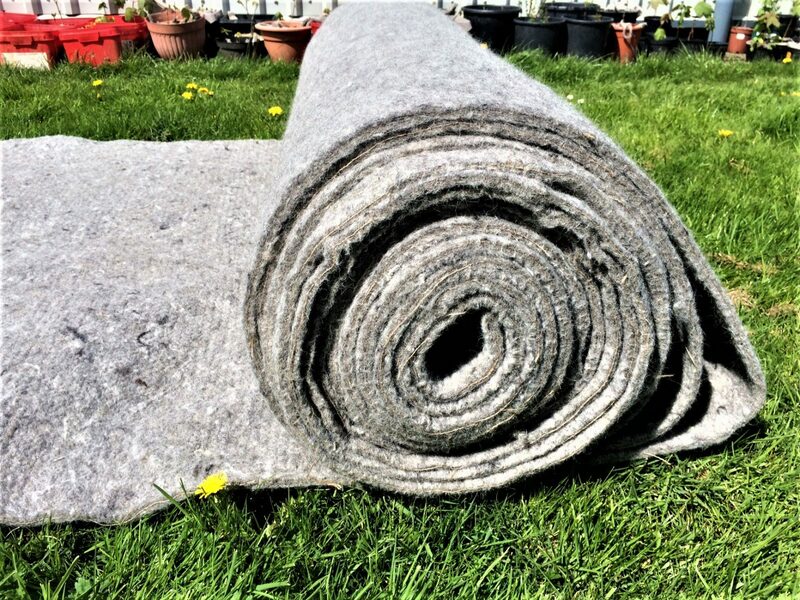 The felted jute is brilliant for different sized mulch mats, for pots or straight onto the beds, but we were getting requests for larger pieces of wool felt for larger garden mulching projects. The felt we use for our Chimney Sheeps is to a particular specification, and rather too good to be used as a gardening mulch, but I went back to my supplier and asked if there was any cheaper wool felt available. Wool underlay is invariably made with a plastic-based carrier material in the centre. We have sourced wool felt made onto a jute carrier so it is all 100% biodegradable and natural. What can gardening mulch felt be used for? The wool felt for larger areas has a multitude of uses. We’ve sent a pallet-load of it to an organic farm in Sweden, where it’s used as a bed protector for growing organic crops. 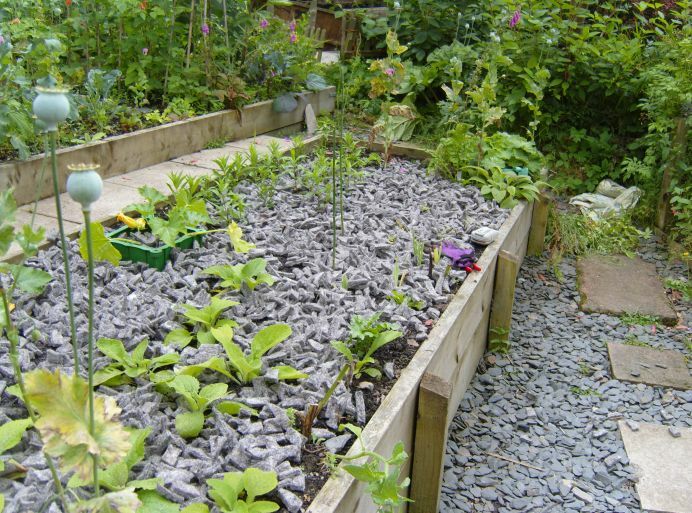 It can be used as a “no-till method” of starting a vegetable bed – simply lay the felt onto the grass or weeds where you want to start the bed. It’s not necessary to remove turfs or dig it all up. Just put a good thick layer of compost over the felt, and start planting. The roots of the plants you sow will push through the felt down into the soil, but the wool-and-jute combination will smother the grass and weeds sufficiently that they will die back and rot away long before the wool felt mulch biodegrades and releases its nutrients into the soil. 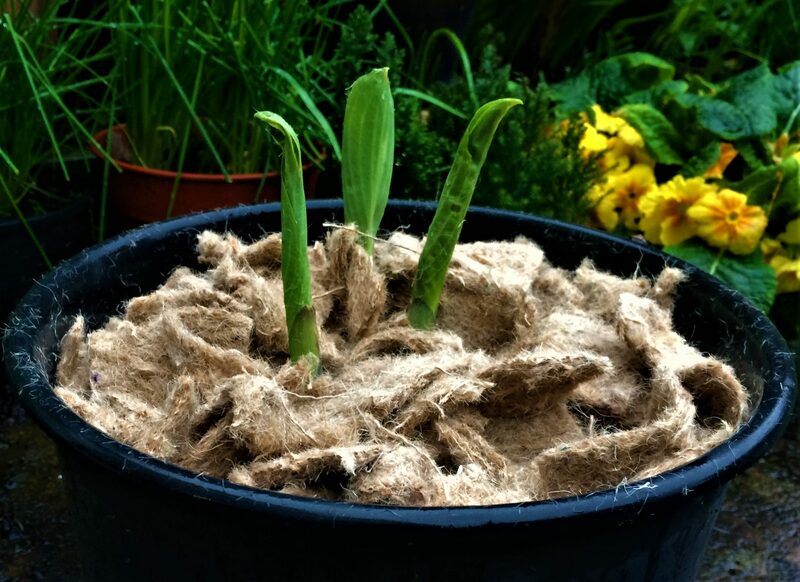 The garden wool felt can also be used to protect delicate plants in the winter. Entire pots can be bundled up in the felt, or you can layer it over the roots or even entire plants to keep them snug and warm. When it comes to planting out your trees, there is another brilliant use for the felt. It can be tied around the root ball to keep the soil in place, and planted along with the tree. As you are probably aware trees are delicate things, gentle giants really, and rely on the eco-system of fungi that develop around its root system. If they are transplanted without this support network it is difficult for them to extract all the nutrients they need, and can perish. By wrapping the root ball in biodegradable wool felt, and retaining the soil it’s grown up with, you can give the transplanted tree a better start in its new life. The wool and jute will retain water to nourish the tree in its early days, and slowly biodegrade releasing valuable nutrients to allow the roots to penetrate deeper into the surrounding soil as it grows. How does capillary matting work? Capillary matting is an excellent way of efficiently using water in the garden or greenhouse. Have you noticed that sometimes when you water your pots, the water gushes straight through? This is often worst with drier plants, exacerbating the problem since the water escapes rather than soaking into the soil. If you stand the pots on natural felt capillary matting, the matting absorbs the water that leaks out. Small points of contact via holes in the base of the pot enable the moisture to slowly be reabsorbed back into the compost in the pot, ensuring that plants get a steady supply of moisture rather than soaking-and-drying which tends to happen without the matting.